The Arlandrian: One by one: Help us plant some trees in Four Mile Run Park! One by one: Help us plant some trees in Four Mile Run Park! and where the trees will grow. With the price tag for the Four Mile Run Park Improvement Plan hovering out there at about $8 million and no funding in site, what should citizens do about it? Some folks decided to get busy and just get started. Over the last few years, a group of community volunteers in Arlandria have come together to perform various improvement projects in and around Four Mile Run Park to complement the work of the Four Mile Run Restoration Plan and the new Four Mile Run Park Improvement Plan. 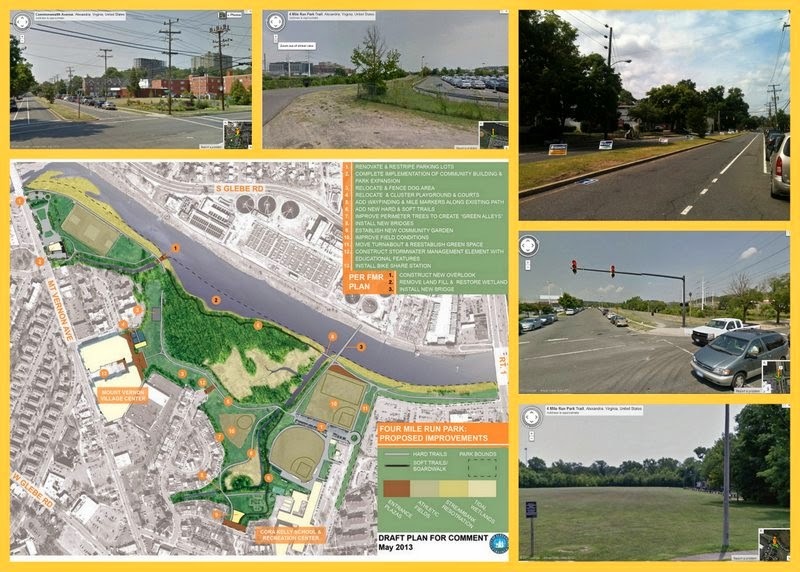 Examples include : the Four Mile Run Farmers & Artisans Market, the Four Mile Run Park Expansion, Commonwealth Park (the rehabilitation of a former electrical substation at 3550 Commonwealth Avenue) and a large tree planting. All of these activities have been documented here on the The Arlandrian. Now, the 4MR Park Community Fall Tree Planting is another community initiative being started in conjunction with the City of Alexandria's Department of Recreation, Parks and Cultural Activities and funded in part by the Four Mile Run Farmers & Artisans Market and Action Alexandria who have each awarded $1,000 to the project. To accomplish this task, the City of Alexandria is partnering with Citizinvestor – a crowdfunding and civic engagement platform for local government projects – to empower citizens to invest in their community. So, in conjunction with the citizen-run Four Mile Run Farmers & Artisans Market, the City launched its first-ever crowdfunding campaign to raise $11,000 to kick-start the recently adopted Four Mile Run Park Improvement Plan by planting up to 30 new trees in the park. Citizens can now donate tax-deductibly to the project at http://www.citizinvestor.com/project/4mr-park-fall-tree-planting but their credit cards will not be charged unless the project reaches 100% of its funding goal before the deadline. Donations can be of any size. While budgets in municipalities across the United States have tightened in recent years, Citizinvestor provides an alternative funding source for projects that municipalities don’t have budget for but that citizens are clearly passionate about. Citizinvestor Co-founder Jordan Raynor said of the launch of Alexandria’s first project, “Citizinvestors have proven eager to invest in public goods across the nation. We are thrilled to be empowering the citizens of Alexandria to invest in this great community. All of the trees purchased through this effort will be planted by volunteers this fall in Four Mile Run Park. Citizinvestor empowers citizens to invest in their community by providing them a platform to propose and crowdfund public projects. Any government entity can post a project to Citizinvestor.com where citizens can donate tax-deductibly to the projects they care about most. Citizens can also leverage Citizinvestor to propose ideas they have to improve their community to their local government. Since launching in September 2012, the Citizinvestor community has been crowdfunding public projects in municipalities across the United States. 66% of all projects have reached 100% of their funding goal. To learn more visit citizinvestor.com. 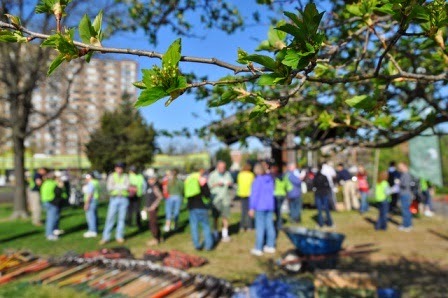 4MRMarket is helping to fix a park, restore a stream and build community!! The Four Mile Run Farmers & Artisans Market (4MRMarket) brings fresh, nutritious food to people of all income levels, provide an opportunity for local artisans and producers of goods to bring their wares to market, strive to reflect the diversity of the community, and improve the quality of life for Arlandria residents and visitors. 4MRMarket is open every Sunday from 9am until 1pm from April 27th until November in Four Mile Run Park at 4109 Mt Vernon Avenue, Alexandria.